Small quaint homes often house clever and quirky storage ideas. With their lack of space, making use of what you’ve got and using a bit of your imagination, you can create the look and feel of more storage in no time. By utilising well-placed shelves, multi-functional furniture and keeping clutter at bay, you’ll be able to store everything and anything you need to with these handy tips and inspiration. These two areas are often neglected and used poorly by many. Unfortunately in most homes they are often very narrow and therefore difficult to furnish. Why not use clever shelving and storage furniture to maximise this tiny unused space. Storage boxes and benches are the perfect way to add not only a feature and somewhere to sit, but also make a great home for shoes, bags and even the dogs lead. By adding shelving to your hallway, you’ll create the feeling of height while also adding more storage too. You can decorate with pretty succulents and draping plants and store books, hats and even house storage baskets or crates for even more of your bits and bobs. If you have limited storage space in your bedroom, consider taking out multiple pieces of large furniture such as drawers, dressers and single wardrobes and replacing them with one triple wardrobe. Having one 3 door wardrobe in place of a number of other chunkier pieces can help create the illusion of more space, meaning you can brighten the room with the odd house plant and mirror. Have you ever thought of having your wardrobe in the hallway? If you have a longer and wider hallway or landing, consider moving your storage out of the bedroom to this space to make your bedroom feel even bigger! Who said the rule was to have a wardrobe in your bedroom anyway? If you live in an older property you may often find that they come with quirky spaces such as alcoves. These spaces are heavily under utilised and tend to be filled with the odd plant pot or photo frames. Create the look and feel of another room without building any walls and turn your alcove into a home office. Simply pop up some open shelving onto the wall which are perfect for storage boxes, stationary holders and books, and construct a simple desk out of a plank of wood either from your local DIY shop or maybe even reclamation yard. Slot a simple, clean lined chair underneath and voila, you have yourself a home office! 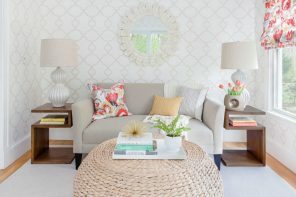 However you choose to create space in your smaller home, you can not only add value by using some of these nifty tips and tricks, but also utilise the space you do have that little bit better.